Verizon officially announced the pricing details for the first Honeycomb-powered device - the Motorola XOOM. It will cost $599.99 with a two year contract, while the unsubsidized price will be $799.99. The tablet is to be launched on February 24. Big Red also announced that the cheapest 3G data plan for the Motorola XOOM is to cost $20 for 1GB, and that the tablet will be upgradeable to LTE in the second quarter of this year. The good news is that this upgrade from 3G to 4G will be free of charge. Yesterday, we reported that the Motorola XOOM won't support Flash at launch, but according to Verizon this perk is scheduled to appear "soon as a free download". 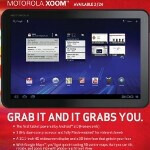 Is $599 on a contract a fair price for the Motorola XOOM? Considering the honeycomb tablet was rumored to be released at a wallet crunching $1200 unsubsidized at release, I would say that $800 (which is the original rumored price) is a much better price fixture. $599 contract price, plus $20/month internet ($480) over 2 yrs= $1079. Now add in your monthly cell phone bill! I could pay the $799 for no contract, but I could buy a good laptop, which can burn cd's, burn dvds, and have more storage for less money. The bottom line, this is for early adopters or people who just want bragging rights. This is too expensive! I travel a lot and it's much easier to carry a tablet than my bulky, heavy laptop. I had a netbook, which was nice for travel, but I still like reading books on a tablet much better. Other than that, I probably wouldn't have a use for it. Burn cd's and dvd's? Welcome to the year 2000. Who even does that anymore? Seriously. there will not be contracts for this device it will be on a month to month offering only just like the samsung tablet. The contract price will be 599.99. FACT. Stop speaking on things you know nothing about, clearly. The Xoom looks great but Motorola and Verizon really should have worked on a more competitive price if they are trying to attract a higher volume of less tech-savvy consumers. A 32gig iPad without contract costs as much as one on contract. I'm not saying that the iPad is better, I would much rather have a Xoom and pay more for it. However, with Apple's branding, and similar price points (most people just see $499 for the iPad base model version and immediately think it's a better bargain) I don't think that the Xoom is an attractive enough device. $250 with a contract and $600 without one sounds much better.